The following account is taken mostly from Roger Pearson's Voltaire Almighty 2005, Chapter 22 and from John McManners, Death and the Enlightenment, OUP 1981 pp.265-269. In correspondence with Mme du Deffand Voltaire had earlier expressed his desire to avoid subjugation to the Church "like a fool" but also to avoid the vulgar defiance which might imperil his fledgling philosophic movement. d'Alembert had attempted to ease the dilemma by counselling conformity. As Professor McManners emphasised, d'Alembert had underestimated Voltaire who, abetted by his lawyer nephew the abbé Mignot and great-nephew Dompierre d'Hornoy, contrived to orchestrate his end with consummate skill. As Voltaire understood well, the giving of absolution was the crucial step to reconciliation with the Church; the trick was to find a confessor who would accept simple faith in God and confession of sins, without insisting that the penitent must disavow his irreligious works or affirm his belief in the Eucharist. Voltaire saw his chance when on February 20th, (his eighty-fourth birthday, marked by a visit from Madame du Barry) he received a letter from a local priest, the formerJesuit abbé Gaultier. A meeting the next day confirmed Voltaire in his opinion that here indeed was a “kind fool” ripe for manipulation. Meanwhile the patriarch's health continued to deteriorate; he had burst a bronchial artery and began spitting blood. Gaultier was duly summoned but it was the zealous young curate of Saint-Sulpice, Faydit de Tersac, who arrived, only to be smartly dismissed by Mme Denis. On 2nd March, Gaultier,authorised by the Archbishop of Paris Christophe de Beaumont, duly appeared and, softened with a gift of 600 livres for his parishioners, absolved his penitent. He also accepted a note, penned on the spot and formally witnessed for the benefit of the ecclesiastical courts, in which Voltaire asked God's forgiveness and ambiguously proclaiming his intention to die in the Holy Catholic religion. It was not too great a concession, but in an earlier version Voltaire had hoped to get away with a statement of the simple truth: "I die worshipping God, loving my friends, not hating my enemies and detesting superstition". Asked to take communion Voltaire simply refused on the grounds that he was spitting blood: “We really must avoid getting the Almighty’s blood mixed up with mine”. When the end finally came some three months later on May 30th the abbé Gaultier and the persistent curate of Saint-Sulpice got no further with their celebrated penitent. Voltaire merely feigned deafness or incomprehension and finally, when the curate hazarded his crucial question, "Monsieur do you recognise the divinity of Jesus Christ? ", shoved the young man away with a "Let me die in peace!". The two clerics consoled themselves that he was no longer in his right mind, a patent untruth since Voltaire was still compos mentis enough some hours later to to say a final farewell to his valet Morand and to commend Mme Denis to everyone's care. Voltaire had outwitted the priests one last time, but would it be enough to secure a peaceful burial? 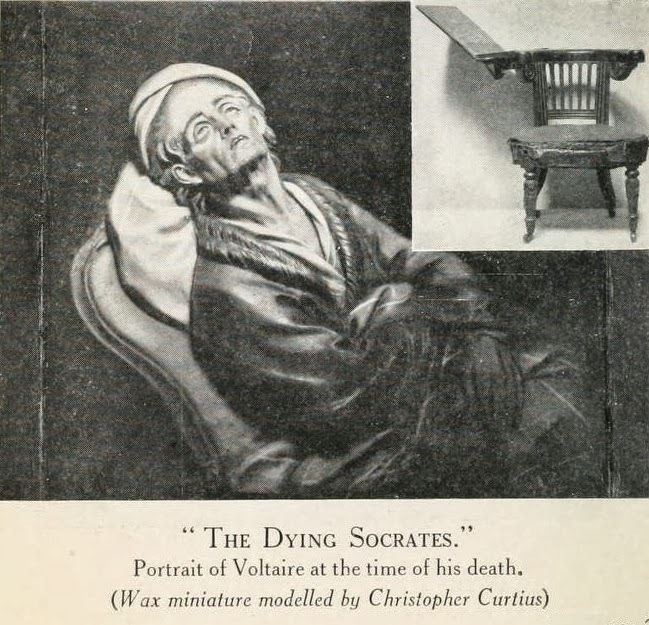 An exact Copy of the Memoir which the Abbé Gaultier presented to the Archbishop of Paris, containing the particulars of the Death of M. de Voltaire. Your Grace has desired a faithful relation of all that passed between me and M. de Voltaire, from his arrival in Paris till his death. As no one is better able to gratify this wish than myself, I shall endeavor to supply the information your Grace is pleased to request. 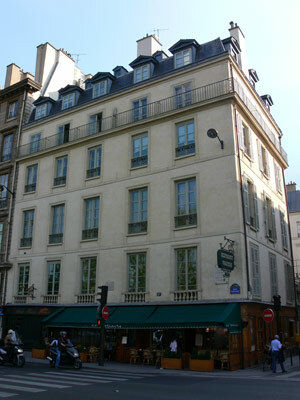 Monsieur de Voltaire arrived at Paris the beginning of February 1778, and took up his residence at the Marquis de Villette's, on the Quai des Theatins. Vast multitudes crowded to see this celebrated man. Nothing was talked of in Paris but M. de Voltaire. Eulogiums were written on him in prose and in verse. I cannot but confess it gave me great pain to see a man so honored, and almost adored, whose abilities had been employed to blaspheme religion and destroy every moral obligation. My uneasiness increased when I considered how much it was to be feared that a person so dangerous could, by his presence, give new vigor to infidelity. I prayed the Omnipotent to prevent the mischief this patriarch of infidels might cause in the capital, and at last determined to write to this scourge of his country, which I did, in the following terms. LETTER from the Abbé Gaultier to M. de Voltaire. SIR, You have many admirers, and, should your wishes fortunately meet mine, I may, as I most ardently desire to be, become one of the number. I will explain myself more fully, if you will grant me a moment's conversation. I am one of the most unworthy of the ministers of Christ, but I shall say nothing unbecoming my profession, or which ought not to give you pleasure. Though I do not flatter myself you will indulge me in what I should esteem so great a happiness, I shall not fail to remember you, when I celebrate the most holy sacrifice of the mass. I shall fervently pray to the just and merciful God for the salvation of your immortal soul, which perhaps is on the very point of rendering an account of all it's actions. Pardon me, Sir, for the liberty I have taken; my intention is to render you the greatest of all services, which I may do, by the assistance of him who has ordained that weak things shall confound the strong. How happy should I esteem myself, if your answer should prove analogous to the sentiments with which I remain, &c.
Signed, GAULTIER, Priest. Paris, Feb. 20, 1778. Your letter, Sir, appears to me that of an honest man, which is sufficient to determine me to receive the honor of your visit, on the day and hour most agreeable to yourself. I shall address you in the same language which I used when I gave my benediction to the grandson of the sage and illustrious Franklin, the most respectable man of America; I uttered only these words, God and liberty. All who were present shed tears ; I flatter myself your principles are the same. I am eighty-four years of age, and must soon appear before God, the Creator of all worlds. If you have any thing to communicate, I shall consider it as my duty and an honor to pay you every attention, notwithstanding the bodily pains under which I suffer. The desire of knowing the most celebrated man of this age has occasioned my taking the liberty to write to you; I have not the honor of a personal acquaintance with you, but I am extremely intimate with a friend of yours, M. de Lattaignant, and I dare flatter myself I possess his confidence. His infirmities, and his great age, have led him to make those reflections which every thinking person ought to make, when he prepares himself to appear before God, and which I have no doubt you have frequently made yourself. If my ministry may prove agreeable to you, you have only to speak, and I will conform myself to your wishes; I am not the only one in Paris who can render you this service; you may, doubtless, find ministers much more worthy than myself. He heard me with great attention, and as soon as I had ended, asked me, whether what I had done originated entirely with myself. I replied, yes, which was really the truth. Are you not sent, said he, by the Archbishop, or the Curate of St. Sulpice. No, I assure you, said I; should my proceeding be disagreeable to you, I have no doubt of your indulgence; if, on the contrary, you approve of it, the Lord be praised. He said, he was very glad to hear I did not act under any other person's directions, and asked me, what I had been, and who I was. I told him, I had been a Jesuit during seventeen, and curate of St. Mard, in the diocese of Rouen, for near twenty years; that, at present, I was employed in ministerial functions at Paris, and celebrated mass every day at the Hospital for Incurables. M. de Voltaire made me several offers of his services, but as I thought much less of the transitory rewards of this world, than that eternal recompense which God has prepared for his elect, I said to him, ah, Sir, how well should I esteem myself rewarded by your conversion; the merciful God desires not your destruction, return therefore to him, since he is willing to return to you. M. de Voltaire, apparently affected by these words, said he loved God. I replied, that was a great thing, but that it was necessary it should produce some fruits, for inactive love could never be the true love of that God who is the principle of action. M. de Voltaire said several other things, which I answered in such a manner as appeared satisfactory. Our conversation was interrupted by three different persons. Mr. Abbé, said the first, let me beg you to conclude what you have to sa ; you see M. de Voltaire vomits blood, and is unable to speak any longer. M. de Voltaire replied, with vivacity, Sir, let me request you will not deprive me of the Abbé's company, he is my friend, and does not flatter me. About three quarters of an hour afterwards Madame Denis came, and said to me, with great mildness, Mr, Abbé, let me intreat you to leave what you have farther to say till another opportunity, my uncle must be much fatigued. I then took my leave, after asking permission to call and see him occasionally, which he very readily granted. I assured him, that I should remember him every day in the sacrifice of the mass. He thanked me, and appeared very much affected. Adieu, M. de Voltaire, said I, as I left him, be certain you have not in the world a better friend than myself. I directly went to give an account of what had passed to the Curate of St.Sulpice, and also to the Abbé de l'Ecluse, Vicar General to your Grace. I told them, that it was probable M de Voltaire would have recourse to my ministry, and desired instructions how to act in that case. They gave me their advice, to which I have strictly conformed. After which I incessantly employed myself in praying, and procuring the prayers of others, for the conversion of M. de Voltaire. You promised me, Sir, to come and converse with me. You will greatly oblige me by taking that trouble as soon as possible. Signed, Voltaire, at Paris, February 26, 1778. Madame Denis, niece to M. de Voltaire, presents her compliments to the Abbé Gaultier, and would be much obliged to him if he would call on her uncle. February 27, 1778. At the house of the Marquis de Villette. 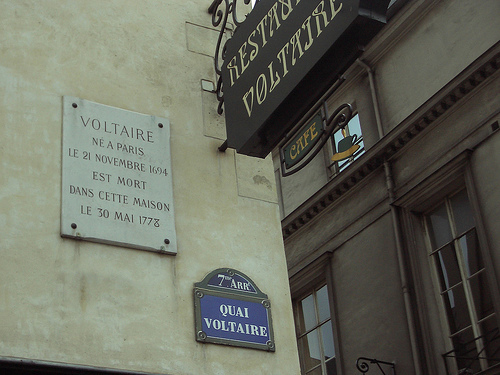 On the 27th of February, as soon as I had celebrated mass, I went to the Marquis de Villette's, to se M. de Voltaire; on that day I had only an opportunity to speak to Madame Denis, who told me, that the Curate of St. Sulpice had been to advise M. de Voltaire not to defer confession, and that he had answered he committed himself entirely to me. After this visit, I went to give an account of what I had done to the Curate of St. Sulpice. I, the underwritten, declare, that having been attacked during four months with a vomiting of blood, at the age of eighty-four, and unable to drag myself to church, the Curate of St. Sulpice has added, to his other good actions, that of sending to me the Abbé Gaultier, a priest, to whom I have confessed myself, trusting, should God take me under his protection, I shall die in the Catholic faith, in which I was born, and praying the divine mercy to pardon all my errors: and if I have ever brought a reproach upon religion, I ask pardon of God and the church. Signed, Voltaire, March 2, 1778, in the house of the Marquis de Villette, in presence of the Abbé Mignot, my nephew, and the Marquis de Villevieille, my friend. Having been informed, by the Abbé Gaultier, it has been asserted, in a certain society, that I had protested against whatever I might do at my death, I hereby declare I never made use of any such expression, and that it is an old piece of pleasantry, falsely ascribed long ago to many learned men, who were more enlightened than Voltaire. M. de Voltaire, when he gave me this retractation, said, in the presence of the Abbé Mignot and Villevieille: you, no doubt, intend, Mr. Abbé, immediately to insert it in the journals: I have no objection. I replied, that it was not yet time. He then asked me, whether I was satisfied? I told him, that this retractation did not appear to me sufficiently ample, but that I would communicate it to your Grace, which I did, but which you likewise did not think sufficient. I left a copy of it at your Grace's chateau de Conflans, where you then were. I also went to the Curate of St. Sulpice, to let him know how I had proceeded, and left him a copy of this retractation, which he did not think satisfactory. At the same time I gave him a note from M. de Voltaire, in which he promised him six hundred livres for the poor of his parish. SIR, I Wish much to hear from you. I have called frequently at your hotel, but without effect. I have always been told, you were not to be spoken with. I wish nothing so much as the re-establishment of your health. I never fail to pray, when I celebrate the holy sacrifice of the mass, that God, of his goodness, would bestow on you many happy days. Be assured, Sir, no one can feel more sincere or more ardent wishes for your welfare. If you will permit me to revisit you, I will, then, amply explain what I cannot express in this letter, which, believe me, is dictated from the heart, and not from the head. I have the honor to be, &c.
Signed, GAULTIER. Paris, March 13, 1778. The master of the house has ordered the porter not to admit any ecclesiastic, except the curate of St. Sulpice. When the patient shall have better recovered his health, he will take a pleasure in receiving a visit from the Abbé Gaultier. Signed, DE VOLTAIRE. Paris, March 15, 1778. SIR, I Have made many enquiries after your health, from those who frequently see you; and they tell me you are much better. No one can more sincerely desire its perfect establishment than myself. I never forget you in my prayers; if they are efficacious, you will experience their happy effects. I have several times been at your hotel, to congratulate you on your recovery, but could never gain admission. The interpretation of which refusals it is impossible to mistake; especially after your having written to me, that you would see me again, with pleasure, as soon as you were something better. I shall cease my importunities at your door, for it is useless to knock at any other door than that of your heart; at which I am sure I have had admission. How great would be my happiness could I become instrumental in bringing you acquainted with what alone constitutes true happiness. Signed, GAULTIER. Paris, March 30, 1778. I learn, Sir, from public report, that you are dangerously ill. This news afflicts me much: but what increases my grief, is, that I have heard nothing further from you. Though every effort I made, after your last illness, to gain admission was ineffectual, the remembrance of that shall not impede my return, should such be your wish. Should the Almighty be pleased to call you hence, how happy would it be for you, were you prepared to appear before him who is the great judge of judges : and how deplorable your state, should you be cut off ere you had properly reflected on the grand work of salvation! Ah ! my dear Sir, think seriously of this important matter; and of this only. Take advantage of the little time you have to live. Time with you will soon be past: and eternity will commence. Signed, GAULTIER. Paris, May 30, 1778. I retract whatever I may have said, done, or written, repugnant to morality, or against the Christian religion, in which I have had the happiness to be born; against the adorable person of Jesus Christ, whose divinity I am accused of having attacked; and against his church, in the bosom of which I desire to die; making this present reparation in the face of the world, which I have offended by works that have for so many years back appeared under my name; and this reparation is not the consequence of the decay of my intellects, enfeebled by old age, but of the grace of Jesus Christ, of which I was so unworthy, and which has opened my eyes to the horrible danger I have been led into, by the delirium of my imagination. I desire that this recantation may be inserted in all the journals and gazettes in Europe; in order that it may become as public as the offences I have committed, and which I am desirous to repair, as far as the short remains of life will permit. Signed at Paris, this thirteenth of May, 1778, in the presence of the Curate of St. Sulpice and the Abbé Gaultier. The Abbé Mignot promised me that his uncle should sign this retractation. I then told him, that I should be very happy if the curate of St. Sulpice might be present, when M. de Voltaire retracted; and we went to the house of that worthy pastor, who willingly agreed to accompany us. Before we entered the chamber of M. de Voltaire, I read the retractation I had drawn up to the Marquis de Villette, who said, it met with his entire approbation. We then entered the apartment of M. de Voltaire; the curate of St. Sulpice desired to speak with him first, but M. de Voltaire did not seem to know him. I then endeavored to speak to him in my turn. He seized my hand, and shewed signs of confidence and friendship; but I was much surprized to hear him say to me, Mr. Abbé Gaultier, I beg you would make my compliments to the Abbé Gaultier. He continued to say several other unconnected things. As I perceived he was delirious, I said nothing to him either of his confession or his retractation. I requested those about him to let me know if his reason returned, which they promised me; but, alas! I was informed, the next day, that he expired three hours after we had left him, that is, the 30th of May, 1778, about eleven at night. If I had imagined he would have died so soon, I would never have left him, but have done my utmost to give him spiritual assistance. He died therefore without the sacraments! God grant he may not have died without a sincere desire to receive them, and an unfeigned intent to retract the impieties of his life. So deplorable an end ought to convince sinners of the danger of deferring their conversion to their last moments.